The vast odyssey that has been the creation, destruction and now rebirth of Final Fantasy XIV has finally come to an end. Three years on from the game’s original, fractured release, Square Enix has managed to pull together something most companies wouldn’t have even attempted – a full mea culpa reboot of the game. Many believed it couldn’t be done, but here we are with the failings of the original version behind us – and what we get is an MMORPG filled to the brim with enough content and narrative to satisfy old and new fans alike. While this isn’t Square Enix’s first attempt at turning the beloved Final Fantasy series into an online experience, the difference between A Realm Reborn and Final Fantasy XI is significant. 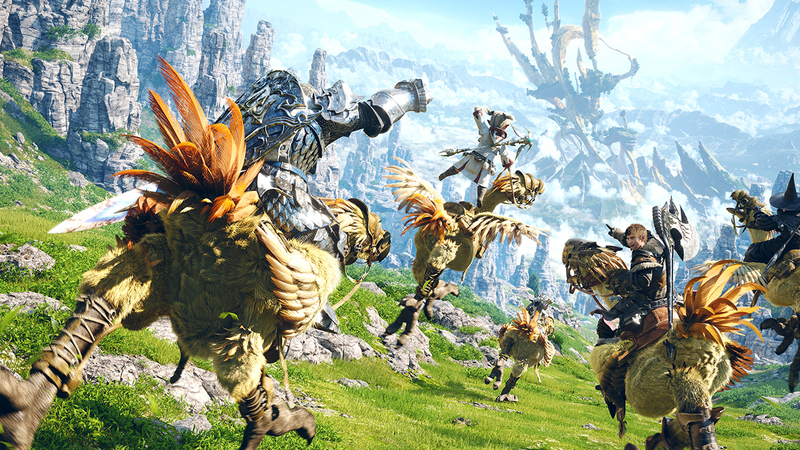 Unlike its predecessor FF14 attempts to set its three facets of design – story, gameplay and graphics – on an equal footing. These three things have come together to create what might be the most accessible pay-to-play MMO to date – and for good reason. Rather than relying on a boat-load of melodrama driven by fop-haired androgynous heroes, A Realm Reborn’s story presents a much more mature narrative to its audience that pairs well with artwork led by Akihiko Yoshida. In Final Fantasy terms, the game is closer to the Ivalice series of games than anything else – something I consider a resounding endorsement. Players will choose from one of eight unique character classes.Set five years after the end of the original FF14, where the realm was effectively razed by the long-dormant primal Bahamut, ARR weaves a new tale that harkens back to those past events, somehow managing to cater to the few who did spend time in the original FF14’s world along with newcomers. As an adventurer appearing in this new era, players will explore the world in its period of reconstruction. By piecing together past events between the coming of Bahamut and the present age, conflict is ever apparent as the Beastmen tribes – worshippers of the primals like Ifrit and Titan – the expansive Garlean Empire and the Ascians seek to throw the realm into strife. Even without having experienced the original release, the story eases players in and paints the narrative in a style that mirrors your typical epic Final Fantasy. Unlike most MMOs, ARR’s story is thrust to the forefront of the game and leads characters along through various locations, allies and unpredictable villains while giving a sense of importance to your character as he or she joins the Scions of the Seventh Dawn, lead on a task to protect the realm. Lending to its merits as a single-player friendly experience, it’s not uncommon for NPCs to join in to help you tackle giant or multiple hordes of creatures, often giving you direction on who to take out first in group fights. The story behind ARR is interesting, often complex, and masterfully bolstered by an excellent localization – it’s a mature FF that I can certainly appreciate for its depth. While your character remains silent aside from some minor dialogue choices that show up here and there, the rest of the game is heavy on text – though also light on voice acting despite offering up several language choices. The decision to only voice a handful of the cutscenes is somewhat disheartening, but the story itself is quite grand as it deliberately takes the player from one new location to the next. 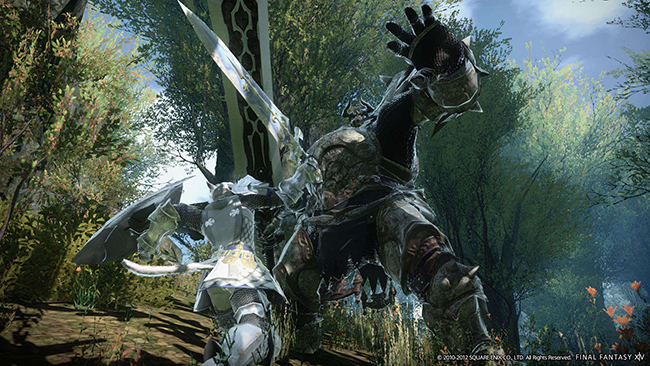 The core of ARR’s gameplay is the typical MMO affair – instead of a pre-set character, players will select one of eight classes, each starting them off at specific city-states around Eorzea. For example, if you decide to roll an Archer, you’ll start out in the forests of Gridania, or if you want to be a Gladiator you’ll end up in the desert city of Ul’dah. Each class falls into general MMO jobs such as tank, damage dealers, and healers. Although you’ll start with one core class, come level 10 you’re basically free to move on to any of the other starter classes you’d like – each available on a single character. Come level 20, you can join one of the game’s three Grand Companies – special “guilds” that offer specific missions and access to your own personal chocobo. Upon reaching level 30 FF5-style job classes become unlocked, although you’ll need to level another base class up to level 15 in conjunction with your level 30 character. Leveling Gladiator to 30 and White Mage to 15 causes the Paladin job class becomes available, for instance, which allows for a bit of mixing and matching of abilities such as Cure and Protect – two abilities normal Gladiators don’t have access to. Another example lies with the Archer class, which requires a level 30 Archer and level 15 Pugilist to obtain Bard. Whichever path you choose, it’s important to consider these job upgrades as it lends greater abilities as the game ramps up difficulty in the later dungeons and enemy encounters. Job classes offer more powerful abilities necessary for high level dungeons.Combat itself is reminiscent of most MMOs with sets of skills that fill a convenient hot bar. Each skill is earned through leveling, with specific skills dropping as you reach certain heights. Skills are based on classes so as an Archer I had various bow skills with varying levels of Technical Points (TP) needed as well as damage it would deal to an enemy. In place of Final Fantasy’s usual ATB system, ARR relies on skill cooldowns – a limiter that also applies to items and other abilities. Depending on the class, pairing certain skills in succession allow for bonuses – such as the Pugilist who can perform a special strike after hitting two skills in a certain order before it. Players are offered two forms of control on both formats – keyboard and mouse or gamepad. You might think the controller would prove limiting, but Yoshida and his team have clearly worked hard to create a sensible, smart gamepad control scheme – the result being the Cross Hot Bar. By holding down R2, skills and items can be accessed with ease and controlling the player character happens just as it would in a single player game. Keyboard is still arguably the way to go if you’re comfortable with it, but if you’d prefer a pad this is at least a viable option. The game provides many different outlets for gaining experience and levels – quests, downing enemies, random happenings known as Full Active Time Events (FATEs) and instanced dungeons. Quests are simple enough – they’re indicated by a specific marker over NPCs and the main story quests have their own special icon as well. Available quests will be lit up in gold while higher level quests will be locked out with a red icon. Upon completion of a quest, the icon switches to green and you’ll be able to collect rewards such as experience, gil and even special items. Realistically you can gather an entire wardrobe for your character simply by going through quests, saving up your gil for more important things like travel or other items. 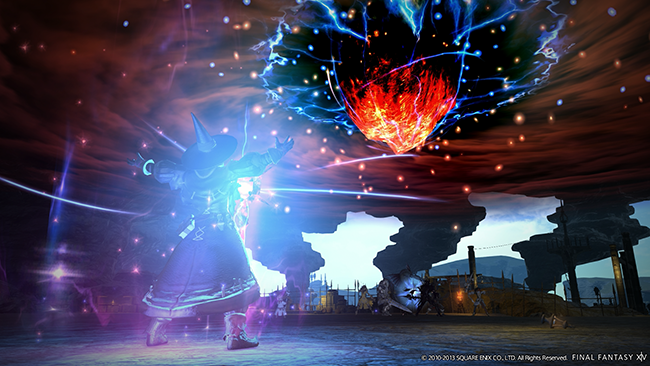 Although the main story of ARR can be completed solo, there are instanced dungeons both part of the narrative and optional that require the cooperation of other people. Dungeons won’t be available until around level 15 when the player is sent to Limsa Lominsa. From there, the story hits you with three different dungeons in a row but they’re beautifully done and generally a blast to go through, depending on the human element of your team of course. 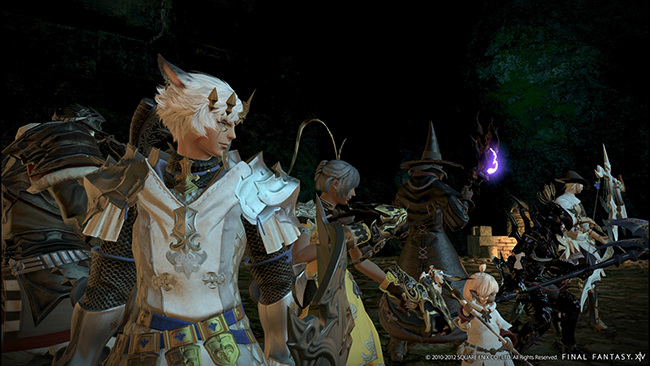 Dungeons and some other instances are populated by use of a Duty Finder that pulls random people to satisfy the needs of a tank, healer, and two DPS players. Once the party enters a dungeon, things are fairly easy going, with specific goals to be met in order to reach the often difficult final boss in each area. The Duty Finder is an interesting idea, but ultimately the lengthy wait to get into some instances and the tendency for some people to abandon early tend to hamper the experience. This especially becomes evident in the later, higher level dungeons as players quit out should things not go their way, or one person in the group brings down the experience for everyone else. ARRs dungeons are plentiful and provide thrilling experiences with four person parties.ARR’s visuals are often quite stunning, the vast world of Eorzea laid bare to explore across forests, coastlines and even the high desert. The world features a day/night cycle and weather conditions shift dynamically. Whether you’re traversing the tree-shrouded city-state of Gridania or enjoying the view by the sea in Limsa Lominsa, the world of ARR is full of life and the new engine built exclusively for use in the game looks and runs beautifully on both PC as well as the PS3 system. Watching the light filter through the trees provides a small sense of realism in a game world that looks equally as lived in and is peppered brilliantly with the fantastical musical talents of Masayoshi Soken whose score is apt for a mainline Final Fantasy title. If you’re a fan of the FF series, ARR has a lot to offer, with fan service and cute nods rampant throughout the game. Such winks are often tailored to the realm in their own way, subtle or otherwise. I found myself intrigued by the Tiny Bronco, Limit Break and Materia systems pulled from FF7; musical cues from FF2; and of course the much-publicized Magitek armor straight out of FF6. Love it or hate it, ARR has pulled from some of the series best and adds a little familiarity to the game for those long-term fans of the series. Should we consider ARR an apology? That I don’t know – as the reach of the original game was quite limited, so toxic was the early word of mouth. Claims of brand damage and other hyperbole were probably a bit exaggerated, but it was clear Square Enix felt the drive to right what was wrong – and they succeeded. It’s now a matter of if the players stick around and pay subscription fees to make the effort worthwhile – but Yoshida and his team can rest easy knowing they took a damn fine swing whatever the outcome. Whether you’re a MMO fan or simply a Final Fantasy fan, I wholeheartedly advise you to give ARR a shot. It may surprise you – something about its myriad of gameplay options, level of polish and spell-binding narrative recall that Squaresoft magic that has been missing for all too long. Most impressive of all is that that Yoshida’s team managed to pull all of this off in a little over two years – a feat that was largely unexpected, given Square Enix’s apparent struggle with timely development. It’s a little humbling to know that one of the best FF titles I’ve experienced to date was constructed in such strange and stressful circumstances, but you know what they say – pressure makes diamonds. Disclaimer: This review was based off final retail code of the English PlayStation 3 and PC versions of Final Fantasy XIV: A Realm Reborn provided by Square Enix. Read more about the Nova Crystallis review policy here. Posted in Final Fantasy XIV, Reviews, Special. I can agree with most of this. I likely won’t be doing a review of the game myself, but I will say that I’ve enjoyed it quite a lot and I usually have a strong dislike for MMOs. Eh, I don’t much care for MMOs. But glad to see that those that do have a better game to play around with. I am reserving this for PS4 hopefully.I will soon need this in the inevitable FF drought until XV’s release. Nice review I mostly agree upon. Enjoying A Realm Reborn a lot myself. Frankly, I came here expecting some bias, but as I read through your entire review, I wholeheartedly agreed with each and everything you wrote. SE has truly outdone itself. One question, though. Did you review the PC or PS3 version of the game? And did you play it using a gamepad or a keyboard and mouse? I played both versions, using a keyboard/mouse on PC and the DualShock 3 controller on PS3. I don’t care for MMOs either, but I really fell in love with this one. It presents itself more as a single-player FF and I think that makes it more appealing to me. I bet you liked the PC version the most. Actually, I enjoyed it on PS3 the most since I could relax a bit more while playing. Good game before its time hopefully it’ll live up to the first one, is there any news on versus? Live up to the first one? It’s better than the first one. I bought this game yesterday, but all I’ve had time to do was download the update and complete a few quests which involved walking around. Hehe. I’ll have to double check because I just chose the first world on the list, but I believe it’s Brynhildr. Hyperion was marked with “NA Legacy” in parentheses… doesn’t that indicate that it’s only for beta testers? Also, what does being in a Free Company enable you to do? I haven’t come across anything in the game that made any mention of it yet. After you choose your Grand Company at Level 20ish you can talk with someone at the company HQ to learn a little bit about Free Companies. To start one you have to be Level 25, have 15,000 Gil, and must have three people beside yourself willing to join. Once you’ve sent the FC creation invites and they’ve accepted, you turn in the “signatures” and those three (along with you) become founding members. Free Companies have commnunity storage boxes, which are littered all over the world and allow you some extra slots to share things between FC members and so on. As your FC levels up (mostly from members doing FATEs and Dungeons, supposedly with a bonus for doing so together) you can earn extra slots for your item storage as well as special abilities. When you get high enough level, you can put your FC crest into your personal gear. When the housing system rolls out, a Free Company can have a house as an HQ which confer special effects on your members. I think there might be more, but I literally woke up 5 minutes ago. Just got the game, and SO MANY UPDATES :(!! !